President Donald Trump has signed a bill to create a national historic park in Atlanta honoring Martin Luther King Jr. The new law expands an existing historic site commemorating King to include the Prince Hall Masonic Temple. The temple served as the headquarters of an organization once headed by King, the Southern Christian Leadership Conference. The site currently includes King's childhood home and a church where he was a pastor, Ebenezer Baptist Church. 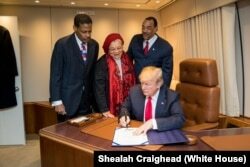 President Donald J. Trump, with Alveda King, center, niece of slain Civil Rights leader Dr. Martin Luther King Jr., and joined by Isaac Newton Farris Jr., left, nephew of Dr. King, and Bruce Levell of the National Diversity Coalition for Trump, right, signs the Martin Luther King Jr. National Historical Park Act, Jan. 8, 2018, aboard Air Force One, in Atlanta, Ga.
Trump signed the legislation aboard Air Force One on Monday after arriving in Georgia to attend the college football championship game. He is being joined by King's niece Alveda King. White House spokesman Hogan Gidley says King made America "more just and free." Next Monday is the federal holiday honoring King.